In the above image, “RMS Queen Elizabeth taking her spot at Pier 90 in Manhattan’s Luxury Liner Row,” The RMS Quenn Elizabeth is not berthed there. She has three stacks and all the vessels in pier and on the Hudson show two stacks. I immigrated on the Queen with my parents and two brothers in January of 1855. 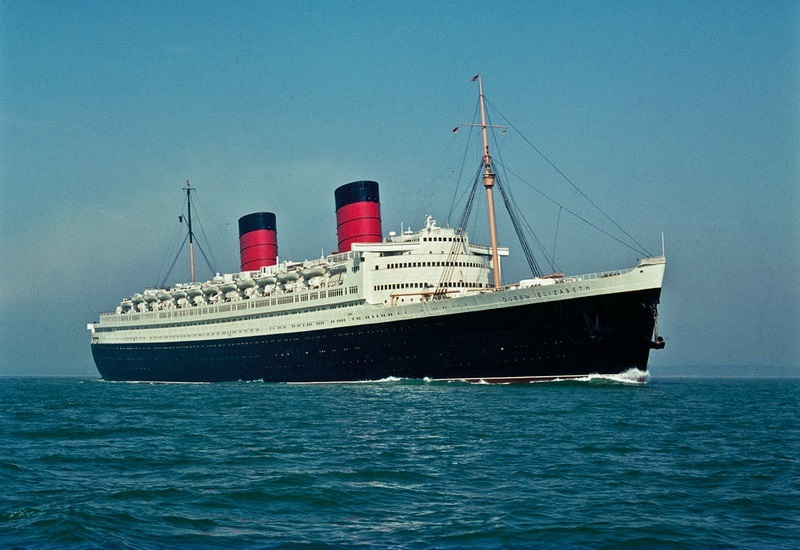 RMS Queen Elizabeth (1940) had 2 stacks. It is she who is pictured arriving at Pier 90. The other 2 stacker is Cunard’s second Mauritania. The RMS Queen Mary has 3 stacks and is still with us in Long Beach. It is the Queen Mary shown at the top of the page departing New York. One can even read her name on her bow! You are absolutely correct. I’ve swapped out the top photo. Thanks – you guys are awesome. One nit-picking point in an otherwise excellent piece of literary detective work M – in your intro you refer to RMS Queen Elizabeth as a cruise ship, whereas in fact she was an ocean liner – in fact one of the greatest (NB an ocean liner travels on a line back and forth between points A and B, whereas a cruise liner operates purely for pleasure in a peripatetic circle from point A back to A.
Interestingly, the film of Diamonds Are Forever uses the P&O flagship SS Canberra, not the QE1’s successor QE2 (QE1 as featured in the book having been withdrawn by then).